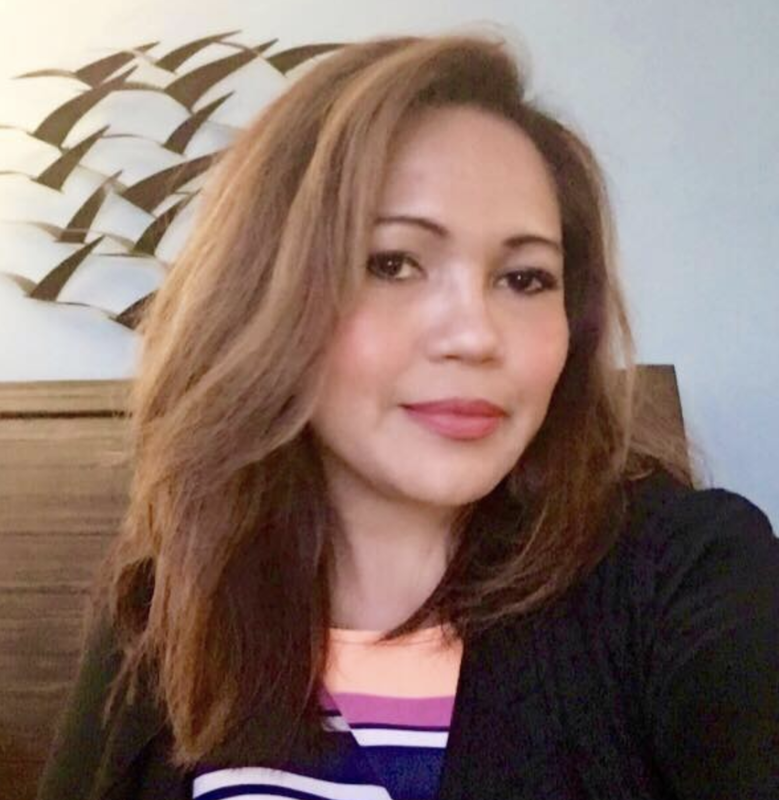 I have always loved Fall because it is the time of year when I get the most inspired to cook and bake despite my busy schedule. My fall favorite recipes are definitely making their way out of the recipe box and into my weekly meal planning! What really makes these vegetables taste so amazing is when I add an extra kick of roasted chicken flavor by using Better Than Bouillon Premium Roasted Chicken Base made with Seasoned Roasted Chicken. Yess! I’ve taken my cooking to the next level with Better Than Bouillon Food Bases! 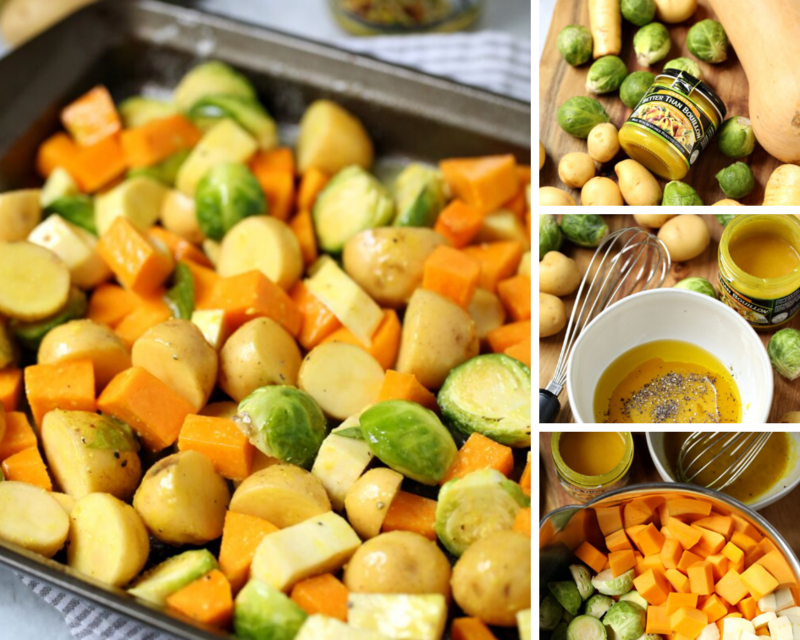 This is easy when combining parsnips, butternut squash, Yukon gold potatoes, and fresh brussels sprouts together in one recipe along with the Better Than Bouillon Roasted Chicken Base. 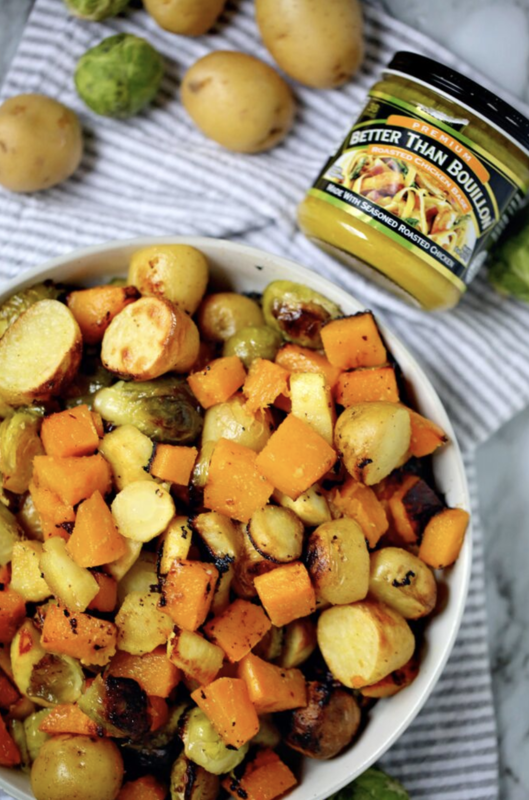 This simple roasted veggie recipe turns into a delicious and nutritious side dish that’s perfect for fall or winter time suppers! Better Than Bouillon is one of the best flavor enhancers I have found that packs such a big punch versus regular dried, cubed bouillon or packaged broth because the food bases are made with natural flavors that add big taste to our favorite meals. There are many creative ways to use Better Than Bouillon Food Bases just like in my Sheet Pan Roasted Vegetables recipe. They’re perfect for homemade soups, pasta, rice, meats, vegetables and more! Check out all the Better Than Bouillon recipes and you’ll be amazed at all the possibilities! Better Than Bouillon comes in so many flavors in four categories: Premium, Vegetarian, Organic and Reduced Sodium. We rarely have leftovers whenever I make these yummy roasted veggies but when we do, they make a perfect side to breakfast eggs the next morning too! 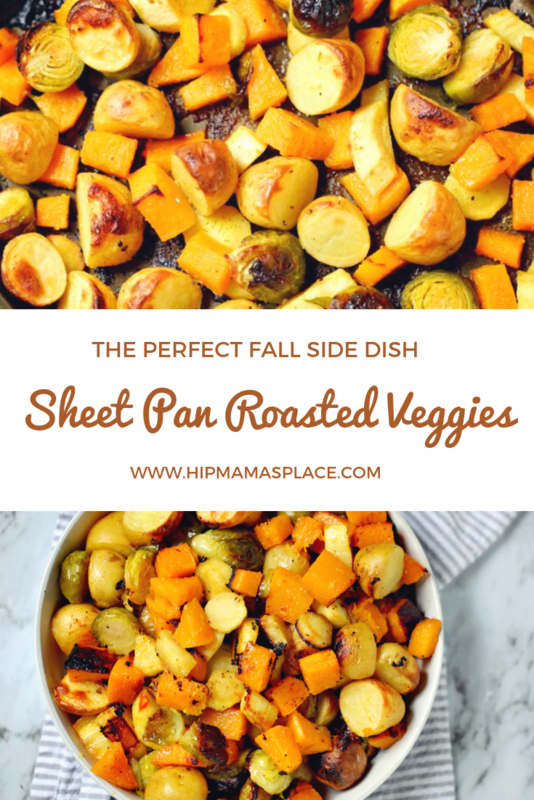 So, try out my delicious Sheet Pan Roasted Vegetables recipe this fall and/or winter season! 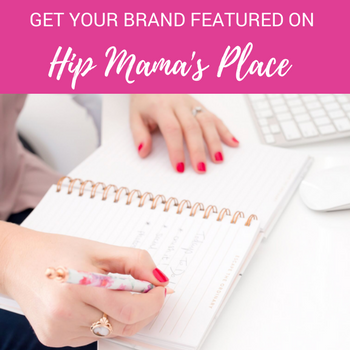 It’s so easy to make and it turns out amazing every time! Combine oil, Better Than Bouillon Roasted Chicken Base, salt, and pepper in a bowl, stirring with a whisk. 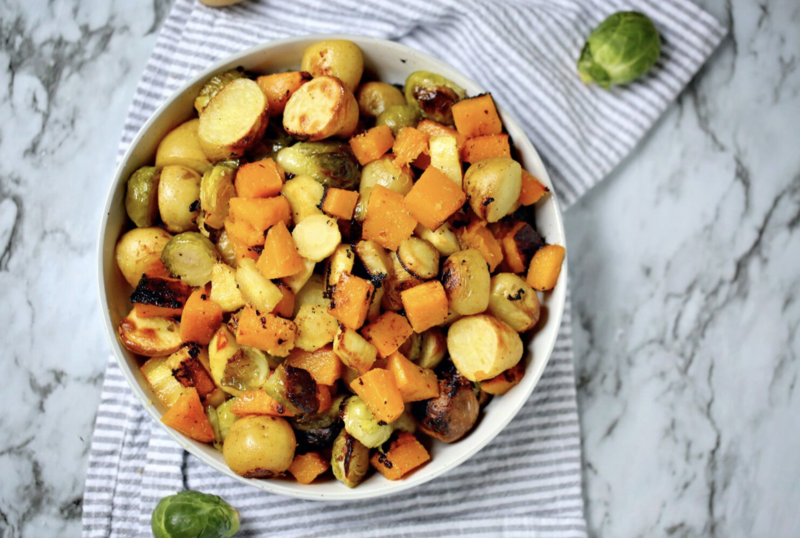 Combine butternut squash, parsnips, Brussels sprouts, and potatoes in a large bowl. Add the liquid mixture to squash mixture; toss to coat. Spread the vegetable mixture in a single layer on a foil-lined baking sheet coated with cooking spray. Remove pan from oven. Drizzle with remaining 1 teaspoon vinegar; toss. It really doesn’t get any easier than this roasted veggie recipe! So put it on your rotation and I guarantee, you will get rave reviews and many requests for more! If you want to know where to buy the Better Than Bouillon Food Bases, go to the product locator or use the online ordering site to purchase those hard to find flavors! If you haven’t tried Better Than Bouillon yet, then you definitely should. 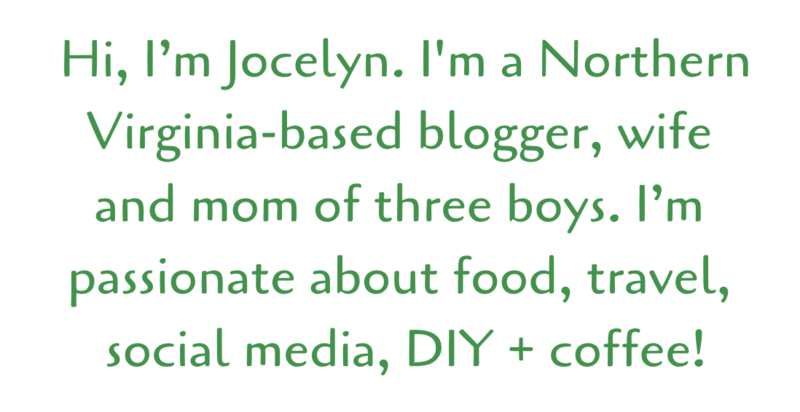 Then come back to this post and tell me what you’ve made or what’s your favorite way to use Better Than Bouillon! 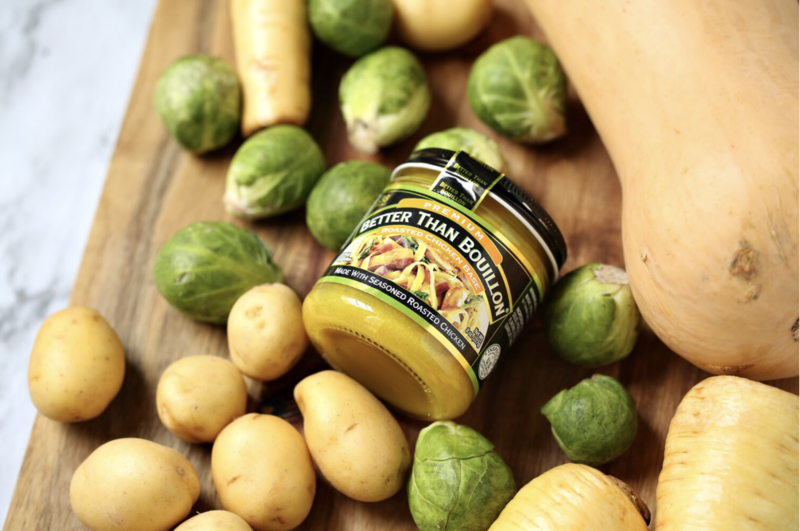 To learn more about Better Than Bouillon products, check them out online at www.betterthanbouillon.com or follow them on their social media pages below! Enter to win great prizes from Better Than Bouillon and Influence Central by entering through the contest entry form below! « National Geographic Kids Books Holiday Prize Pack Giveaway Worth $152! Your recipe looks really delicious! I think I have all of the veggies on hand, so I’ll have to try this recipe out soon! I love a good sheet pan meal and this one sounds amazing! I love adding a little meat to mine and truly making it a meal. I swear, roasted veggies on a pan seasoned just write are the best way to enjoy them! Leftovers can be tossed in a soup and they taste good with any meat! Love squash!!! I love roasted vegetables. This sounds like a great combination. I have never tried Better than Bullion. I am adding it to the rotation. I love roasted vegetables! This sounds like a delicious combination. I’ve never used Better than Bullion. I plan to add it to the rotation. We love pan roasted veggies. We love the variety we can make. I entered, wish me luck! I love sheet pan roasting veggies all the time. You can make a big batch in the oven in one shot. This better than bullion product looks like it adds a great flavor. I’d love to try it! I love that you used squash and brussel sprouts together! We’ve been sheetpan roasting veggies for a while now. The kids love them, especially potatoes, squash, and brussel sprouts. This is seriously one of my favorite go-to and easy meals. 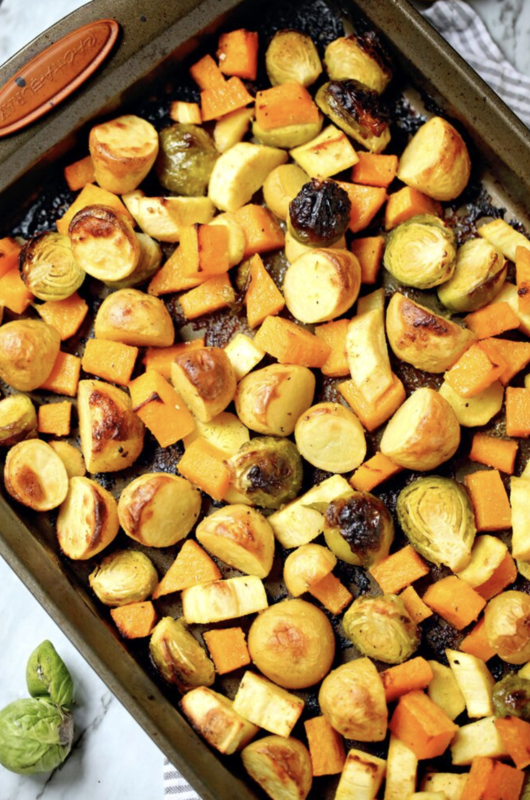 Just throw a bunch of tasty veggies on a pan and roast them-so good and so easy, plus healthy! Oh yes, these look so good! I’ll be trying them soon. I love when I can make sheet pan meals. I’ll be entering the sweepstakes too. Better Than Bouillon is one of my favorite food products. I have three jars in my fridge right now: chicken, beef and vegetable. this looks delicious and something my family would enjoy- i love how easy it is too! That is a great side! Veggies are a big deal in our house, and I love how easy it is to make these. This would make a great Thanksgiving side dish. It’s easy to prepare, one pan, and it looks delicious. I love to roast veggies in the oven and I like trying different combinations. Your roasted vegetables look so delicious! This is one of the most easiest ways to make a full meal or just veggies. This is my go to all the time. Family loves it. Roasted veggies seems new to me. I will definitely try this exciting recipe, this looks so delicious and healthy. Thanks for sharing the procedure! I cook with Better tha Boulion all the time. I had never thought of using it on my roasted vegetables. 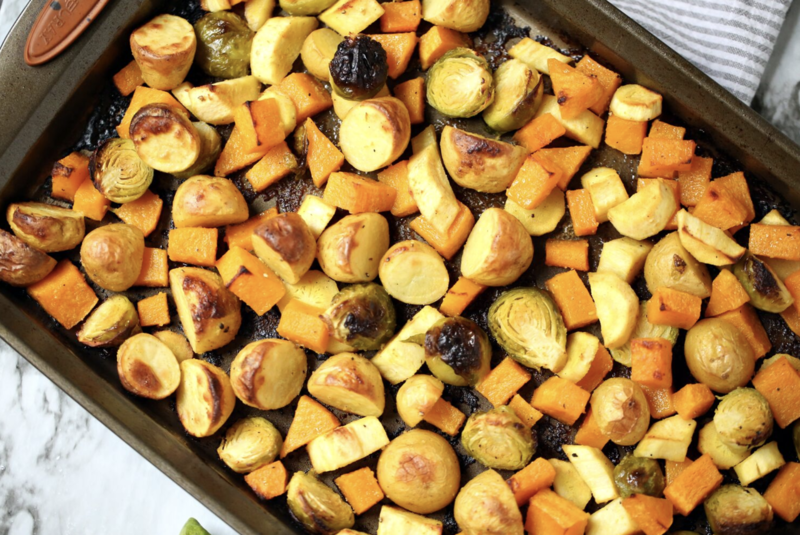 I love sheet pan recipes, because it reduce the cleaning of dishes, love this roasted veggies, they make perfect side dish for holiday meals. I love roasted veggies! These look really delicious! I’m always about sheet pan meals. This would go great with my roasted pork loin. I make sure we always have veggies in every meal. This sheet pan roasted vegetables look really good. The buillon cubes will really make any dish flavorful! Yummo! I actually have some Better Than Bouillon in the pantry. I have never thought of using it like this before. It looks so good. We do this every night. We love it as the combinations are endless. It also allows us to use what is cheap in produce for the season without having to have a whole recipe book on it! Roasted vegetables are my favorite. They are delicious and go well with everything. This is a must try recipe for holidays! I love a good sheet pan meal! These veggies look super yummy!! I love roasted veggies! Your recipe is perfect for fall and Thanksgiving. It’s an excellent side dish. I just can’t bring myself to like Brussels Sprouts. 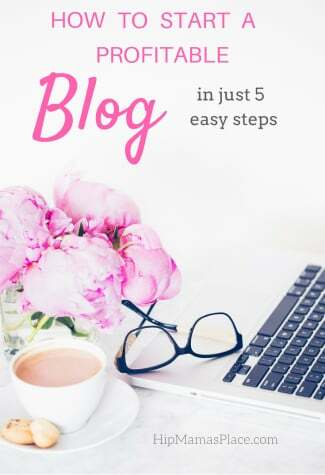 Honestly, I search for recipes, because I’ve had people tell me they just need to be prepared in “my way” to like them – maybe this is the one! Wonderful dish! I did something similar on Monday with Brussels sprouts. I never liked them as a child, but I had them at a wedding last year and loved them. So I made them on Monday with potatoes. I wish my family had agreed how amazing they were. I hear they are making a comeback like cauliflower did. What a great way to prepare veggies! This sounds delicious and you could really come up with a lot of great combinations. I like roasted veggies over pasta, and this would be a perfect way to make different dishes. This looks like a great way to roast veggies and I would try the vegetarian bouillon for my pan. I love brussels sprouts baked in this recipe. I have been sheet pan roasting a lot here lately. Especially Brussel sprouts and potatoes. Love your suggestion and must try next time. Pinning for later. i love a good veggie dish and one pan or sheet with everything you need is a great way to feed a family. I will try this style meal this week. Love sheet pan veggies. Great way to add new veggies to dinner and bouillon is in heavy rotation in our home during this time of the year. I add it to soups, gravies and more. Sheet pan meals is something we do all the time. Fast and one pan mess clean up.